West Viriginia - Here we COME ! Come join General and I for a sip of wine and perhaps to try my olive oil this Saturday Nov. 21 from 12 - 330 Pm at Weis Market 217 Oak Lee Drive, Ranson, WV 25438 !! Whole Foods Event in Naples on Oct. 2 ! Join us for this special evening! CANCELLATIONS: 48 hours notice is required prior to Thursday's tasting. Those making reservations for others and including themselves, are responsible for those RSVP's. Should notice of cancellation not be received in the above mentioned time frame, the tasting fee is still due and the responsibility of the person making the reservation. FHCC is honored to welcome Alexandra Elman, the accomplished and well traveled founder of Alex Elman Wines. Enjoy a night of great wine, delicious food, and a chance to meet an incredible person with an inspiring story! Call 301-739-6933 for reservations by August 1st! Please join General and I at Carrolltown Liquors for a delicious tasting of my wines and olive oil !! Tasting at Ye Old Spirits Shop ! Come join General and I for a crisp glass of Alex Elman's wines from Italy and Argentina ! while finding equanimity between challenge and release. A total sensory experience! Practice alongside the magical Alex Elman. oils with an opportunity to practice. Across the Street Market Tasting ! A Delicious Tasting of Wine and Olive Oil at Across the Street Market ! Wine Tasthing tonight in Monrovia !! located at 19 Carroll Plaza Shopping Center. We'll be pouring free samples of our wine and enjoying your casual company. Come join General and I for a tasting at Cranberries in Westminster, Md on Oct. 4 from 1-5pm. We're excited to see you and pour a glass of our Alex Elman Wines ! Total Disount Liquor Wine Tasting ! Come join General and I at Total Discount Liquor for a tasting of Alex Elman Wines in Eldersburg MD ! It'll put a spring in your step, yes sir. Oct. 3 from 4 - 7 PM. Come join General and I for a Free Wine Tasting at Total Discount Liquors - the largest wine store around on Oct. 3 from 4 - 7pm. Please come out and enjoy a glass in a casual way - looking forward to seeing you ! I will be at the Tampa whole foods from 430 to 6:30 PM on Sept. 25 ! Come enjoy a glass of AE Wines and meet General !! I will be at the Sarasota Whole Foods Saturday Sept 27th from Noon to 2 PM! Come join me for a glass of AE Wines and meet General ! Earth Origins in Sarasota today ! Come have a taste of AE Wines and meet General ! A Food and Wine Pairing Dinner at Cafe Evergreen om Florida !! Spend an evening with us and wine maker Alex Elman...! 4 different wines made by Alex Elman. of the region of which they come. no fungicides and minimal sulfites. our bodies and our environment. sustainable wines that are meant to be enjoyed every day. First course- Clams steamed in Alex Elman Torrontes and smothered in Torrontes cream reduction. Second course- Herb roasted French hen cut chicken basted in an Alex Elman Chianti tomato peasant sauce. Served with fresh vegetables. A New Store where AE Wines are available, and a tasting ! General and I will be at Spirit of Mt. Vernon in Baltimore, MD on September 19 from 5 - 8pm pouring our wines and enjoying meeting our treasured clients. Come join us for a taste ! Cherryvale in Store Tasting ! Come join General and I at Cherryvale Liquors for a free tasting of AE Wines todayfrom 4 - 7pm. It will be wonderful to see everyone there ! Come join General and I at A1 Beer and Wine in Walkersville MD, our hometown ! for a free wine tasting on August 16 from 11am - 2pm. Looking forward to seeing you all there for a casual taste of wine ! Wine Tasting at Dugan's !!! Come join General and I and sip some Alex Elman Wines at Dugan's on August 8 from 5 - 8 pm !!! 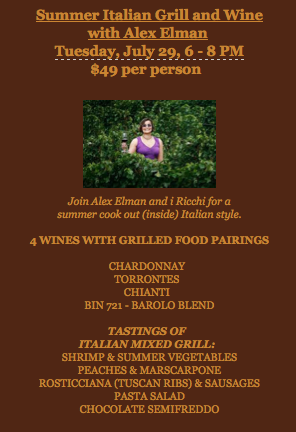 Summer Italian Grill and Wine with I Ricchi and Alex Elman ! summer cook out (inside) Italian style. New Market Beer and Wine NewMarket, MD. From 4-7PM. Come join General and I for a taste of the new Chardonnay and Torrontes Vintages !!! Just in, and the whites are great fresh ! New Market Beer and Wine New Market, MD. From 4-7PM. from 12-2pm - drinks are on Us ! from 1-3pm, and then - double trouble ! Whole Foods North Miami on Monday April 28 from 2-4pm. Looking forward to pouring wine and Olive Oil and seeing everyone ! Happy Thanksgiving to all our family, friends and loyal fans of Alex Elman Wines! Nothing pairs better with Thanksgiving than Torrontes, Chianti and Malbec! A tasting in Branchville, NJ with our Argentine Wine Producer. Come join Alex, General and Pablo, the producer of our Argentinian wines at Georges Wine Gallery iun Branchville NJ on November 9th from 6 - 9pm. A Morristown New Jersey Tasting with the Argentine Producer ! Come out for a tasting event with Alex, General and Pablo, our Argentine producer. The tasting will be from 6-8pm On Friday November 8th at the Wine Chateau. Come join Alex, General and the AE Wines Crew at Serge Bistro on October 29 from 5 to 9pm! Looking forward to seeing everyone out and enjoying the wine and company. Join Alex, General at Richard's Foodporium off Cattleman on October 28th between 4 and 7pm for a free wine tasting and a smattering of cheese and crackers ! Join Alex, General at Richard's Foodporium on Cooper Creek Blvd on October 29th between 3.30 and 6pm for a free wine tasting and a smattering of cheese and crackers ! Come join Alex and General for a wine tasting in Atlanta, GA at Across the Street and Market this September 19th ! Looking forward to seeing you all there !!! Come join General and I for a tasting at the George Inn in New Jersey on May 21st from 530-830 ! A tasting at Montvale in Montvale, New Jersey ! Come join General and I for a tasting at MONTVALE in Montvale, NJ on May 18th from 5 - 8pm on 18 South Kinderamack Rd. Looking forward to pouring for you !! A Tasting at Buy Rite / Liquor City in Bloomingdale, New Jersey ! Come join General and i for a tasting at Buy Rite / Liquor City in Bloomingdale, New Jersey this May 18th from 1 to 4 on 29 Main Street. Looking forward to pouring for you ! Come join General and I at Diamond Liqours in Little Falls, NJ from 530 - 930 pm on May 4. A tasting at the Heights in Hasbrouck Heights, New Jersey ! Come join General and i for a tasting at the Heights in Hasbrouck, New Jersey this May 3 from 4 - 7 on on 65 Rt. 17South. Come join General and I for a tasting at George's this Friday from 4-7pm. A Tasting at Georges in Branchville, New Jersey ! Come join General and i for a tasting at George's in Branchville, New Jersey this April 27 from 5 to 8 on 1 Main St.
A Tasting at H Mart Fresh in Fort Lee, New Jersey ! Come join General and i for a tasting at H Mart Fresh in Fort Lee, New Jersey this April 27 from 1 to 4 at 1379 16th Street. Looking forward to pouring for you ! A Tasting at Burkes in Sparta New Jersey ! Come join General and i for a tasting at Burke's in Sparta, New Jersey this April 26 from 4 to 7 on 6 Sparta Ave. Looking forward to pouring for you ! University of Maryland Alumni Party ! 4th Annual Maryland in Manhattan! A Tasting at Sandy's in Budd Lake ! Come join General and i for a tasting at Sandy's in Budd Lake, New Jersey this April 13 from 430 to 730 at 100 Rt. 46. Looking forward to pouring for you ! A tasting at Seplows in Newton, New Jersey ! Come join General and I for a tasting today from 4-7 at Seplows in Newton, New Jersey, 5 Woodside Ave - have a glass of our fine organic wine and say hi ! A tasting at Wine Country in Clifton New Jersey ! Come visit General and I for a tasting at Wine Country at 519 Piaget ave. Clifton, New Jersey. Come join Alex and General for a tasting at the Jupiter Square Publix Indiantown Rd. and US 1 on April 3 from 12-4pm ! A Tasting at Peggy's Natural Foods in Stuart Florida ! Come join Alex and General for an in-store tasting at Peggy's Natural Food Market in Stuart Florida on Tuesday April 2. We'll be at Peggy's from 2 -6pm, pouring our world famous wines ! A Tasting Demonstration at Publix in Stuart, Florida with Alex and General ! Come out and enjoy a glass of wine on us a the Publix in Stuart, Florida on March 13 from 4- 7PM. General will be in attendance and we look forward to seeing you. Cheers ! A Tasting Demonstration at Publix in Palm Beach Gardens, Florida with Alex and General ! Come join Alex and General for a tasting of our full line of Wines at the Publix in Palm BeachGardens, Florida in the Gardens Towne Square. Cheers ! A Tasting Demonstration at Publix in Jupiter, Florida with Alex and General !. Come join General and I for a tasting demostration of my full line of Wines at the Publix in the Jupiter Square Shopping Center on March 11 from 4-7pm in Jupiter, Florida. Cheers ! A Tasting with Alex at the Publix in Tequesta, Florida ! Come join General and I for a tasting demonstration of my full line of Wines at the Publix in Tequesta, Florida on March 11 from 12 - 3pm. Cheers ! General and I can't wait to visit Nassau Health Foods at Fernandina Beach, Florida for a demonstration and tasting of our wines. Thank you for inviting us, it will be our pleasure. A Tasting Demonstration at Publix in St. Johns, Florida with Alex and General !. Please come out and enjoy a glass of Alex Elman's delcious line of wines with Alex and General at Publix in St. Johns Florida this Friday March 8th from 3 -6pm. We look forward to seeing you there ! Come out to Wholefoods Market in Ft. Lauderdale, Florida to taste Alex Elman's Organic wine selections on Feb. 21th from 4-6pm with Alex and General. Come out to Wholefoods Market in Aventura, Florida to taste Alex Elman's Organic wine selections on Feb. 19th from 1-3pm with Alex and General. Come out to Wholefoods Market in Plantation, Florida to taste Alex Elman's Organic wine selections on Feb. 20th from 5-7pm with Alex and General. Come out to Wholefoods Market in Pembroke Pines, Florida to taste Alex Elman's Organic wine selections on Feb. 20th from 1-3pm with Alex and General. Come out to Wholefoods Market in Pinecrest, Florida to taste Alex Elman's Organic wine selections on Feb. 19th from 3.30-6pm with Alex and General. Come out to the Wholefoods Market in South Beach Miami to taste Alex Elman's Organic wine selections on Feb. 19, 12-2pm with Alex and General. Tasting at Wholefoods Market in Coral Gables, Florida. Come out to the Wholefoods Market in Coral Gables, Florida to taste Alex Elman's Organic wine selections on Feb. 18, 4-6pm with Alex and General. Tasting at The Wine Cottage in Key West, Fl. Come out to the Wine Cottage in Key West, Florida to taste Alex Elman's Organic wine selections on Feb. 17, 5-7pm with Alex and General. A Tasting Demonstration at Publix in Jupiter, Florida. Come join General and I for a tasting at the Publix in Jupiter Florida on Feb. 15 from 4-7pm! A Tasting Demonstration at Publix in Palm Beach Gardens, Florida. Looking forward to see everyone there ! A Tasting Demonstration at Publix in Palm Beach, Florida. Come join General and I at the House of Brews from 5 - 8 pm tonight for a tasting and a talk about wine - perhaps we'll even have a Brewski or two while we're there! Jensen Beach, FL 34957 . A tasting at Wholefoods Market in Naples ! Join General and I at the Wholefoods Market in Naples for a tasting of Alex Elman Wines at 5 - 8pm on Feb. 9th ! Can't wait to see you and pour out my best vintages ! Join General and I at Bailey's Grocery Store on Captiva Island on Feb. 9 at 12 - 3pm ! Can't wait to see everyone in Florida ! Tasting at Wholefoods Market in NORTH Tampa. Join General and I for a tasting at Wholefoods Market in North Tampa on Feb. 8 from 5pm - 8pm. Join General and I at the Wholefoods Market in Tampa for a tasting on Feb. 7th at 5pm ! Wholefoods Tasting in Winter Park, Florida ! Alex Elman and General are back ! A tasting at Mother Earth in Ft. Meyers, Florida ! Come join Alex and General for a wine tasting and demonstration at Mother Earth in Ft. Meyers, Florida on Saturday the 5th of January from 1-4 pm. Tasting at "For Goodness Sake" in Naples, Fl. Come join Alex and General for a wine tasting and demonstration at For Goodness Sake in Naples, Florida on Friday the 4th of January from 2 - 5pm. WholeFoods Tasting in Tampa, Fl. on Saturday the 22nd ! Join Alex and General at the Wholefoods Market in Tampa Florida on Saturday 22 December from 12-3PM. Enjoy a glass of wine, talk about Organics with Alex, and pet General - the top dog in town. Tasting at Earth Origin in Palm Harbor, Florida. A tasting on December 21th at the Earth Origin Store in Palm Harbor, FL. from 12 - 3.30pm. Come join General and I for a taste of Alex Elman Wines and enjoy a moment discussing wine and life. Another Tasting at Earth Origin in Sarasota, FL. A tasting on December 20th at the Earth Origin Store in Sarasota, FL. on Stickney Point Road from 3 - 6.30pm. Come join General and I for a taste of Alex Elman Wines and enjoy a moment discussing wine and life. Tasting at Earth Origin in Sarasota, FL. A tasting on December 20th at the Earth Origin Store in Sarasota, FL. from 12 - 3pm. Come join General and I for a taste of Alex Elman Wines and enjoy a moment discussing wine and life. Tasting at Earth Origin in St. Petersburg, Florida. A tasting on December 19th at the Earth Origin Store in St. Petersburg, FL. from 12 - 4pm. Come join General and I for a taste of Alex Elman Wines and enjoy a moment discussing wine and life. Tasting at Earth Origin in Port Charlotte, Florida. A tasting on December 18th at the Earth Origin Store in Port Charlotte, Fl from 12 - 3.30pm. Come join General and I for a taste of Alex Elman Wines and enjoy a moment discussing wine and life. Tasting at Earth Origin in Naples, FL. A tasting on December 17th at the Earth Origin Store in Naples. Come join General and I for a taste of Alex Elman Wines and enjoy a moment discussing wine and life. We are thrilled to announce that we will be the exclusive wine sponsor for a very special Holiday event with our friends at Esty.com and WorkshopNYC. Etsy is opening a Holiday Store in Soho for 8 Days, Nov. 29th - Dec. 8th. This will be a unique opportunity to have a hands-on experience with some of Esty's most interesting products and meet some of the vendors. WorkshopNYC has done an amazing job with the programming, and has generously turned the house over to Alex on the evening of Monday December 3 from 6 - 930 pm ! 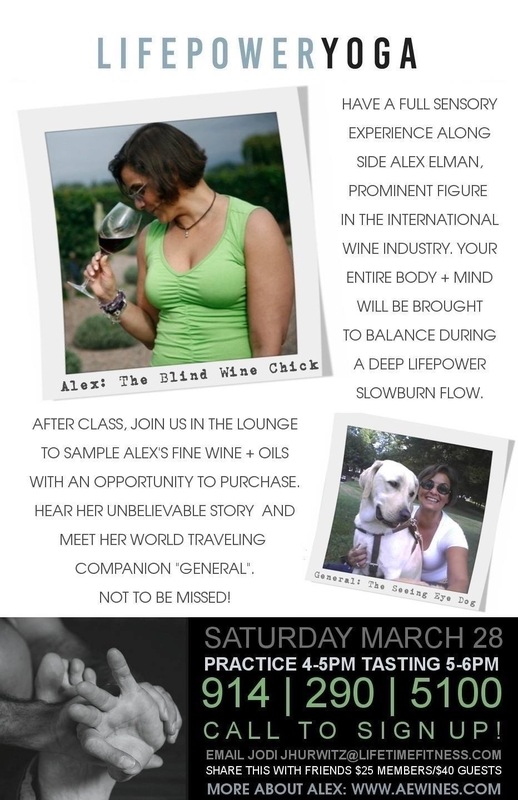 Alex will be pouring her Organic and Dynamic Wines and sharing her fresh, Extra Virgin Olive Oil. She will be talking about pairings for Holiday meals, current topics of interest in the food and wine world, and if you'd like, speak a little bit about her incredible life story. We sincerely hope that you can make it out to this exciting, important event to support Etsy, WorkshopNYC, Alex Elman, and gather together around the simple fact that we live in New York, NOW is "The Holdays", and it is our civic and sacred duty to go out and share in the Spirit of the Seasons together. Please celebrate life responsibly, and often ! 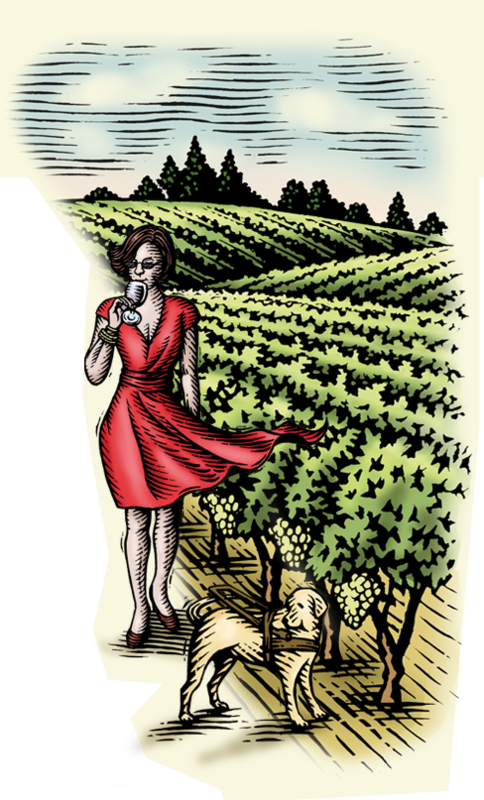 Join Alex and General at Heath's Natural Foods for an in-store tasting of Alex Elman Wines !! Come join Alex and General for an in-store tasting at Heath's Natural Foods in New Smyrna Beach, FL on Oct. 6. We'll be there from 11am - 3pm, pouring our famously delicious wines with a great chance to chat with the maker ! Come join Alex and General for an in-store tasting at Debbie's Health Foods in Point Orange, Florida on Oct. 5. We'll be there from 4pm - 7pm pouring our famous wines and there'll be time to chat with the maker ! We'll be there from 3pm - 7pm pouring our famous wines and there'll be time to chat with the maker ! Come join Alex and General for an in-store tasting at Ward's Supermarket in Gainesville, Florida. We'll be there from 3pm - 6pm, come sniff out some great wine and chat with the maker ! Come join Alex and General for an in-store tasting at Peggy's Natural Food Market in Stuart Florida. We'll be there from 1pm - 5pm, pouring our world famous wines ! A Tasting with Alex and General at Tunie's on Oct. 1. Come join Alex and General for an in-store tasting at Tunie's in Coral Springs, Florida. We'll be there from 2pm - 6pm, pouring our world famous wines. Come chat about the world of Alex Elman Wines with the maker ! Come join Alex and General for an in-store tasting at Nutrition S'Mart in Tampa. We'll be there from 11am - 3pm, pouring our world famous wines. Come chat about the world of Alex Elman Wines with the maker ! Free People - Fashion's Night out ! Come to Free People - Fashion's Night Out! It's a great evening in the City when the stores come alive at night and don't close the doors until late. Head to Free People for tastes of Alex Elman Wines, free music and to check out the Free People's Hot Fall Collections ! It's a great opportunity and we hope to see you there!! Hudson Valley Shakespeare Festival !! We will be pouring our wine at the Hudson Valley Shakespeare Festival ! 8pm ! What could be more civilized? Taste of Long Island City Party in the Park ! Come join Alex and Hanley, the crew and dozens of restaurants, bars, food and food vendors that will come together for one evening under a big top tent, on the water of Long Island City. It'll be a big bash on the river, rain or shine and we'll be pouring Alex's wine !!! Come !!! GANTRY PLAZA STATE PARK ON THE WATERFRONT in LIC! 49th Avenue at the East River. 7 Train - Vernon Blvd (1 stop from Grand Central). Join Isauro Fernandez, creator of ki power vinyasa and Alex Elman, founder of alex Elman wines, for a vino y yoga master class. Elevate your ki, your life force and essential energies through active engagment and stimulate your senses with a one hour ki power vinyasa class followed by a 30 minute guided wine tasting focused on wine regions throughout Spain. Join us at Artisanal for a Wine and Cheese Tango! Max McCallum, Artisanal's Maitre Fromager and Alex will be up to the challenge of pairing the best Artisanal Cheese with the best Alex Elman Wines!! Always an entertaining evening!